I found out through the authors note that The Walled City is based on an actual city in China. A city that used to be a military fort and was transformed in to a den of prostitution, crime, and poverty. This premise alone was enough to keep me reading. But it was the characters that truly shined. This novel alternated between three perspectives. Dai grew up outside the walled city and was forced in to its depths following the death of his brother. He’s been trapped in the city for 730 days and has 18 days to escape. In planning this escape he enlists the help of Jin Lee, and Mei Yee. Not knowing the two are related. Mei Yee was sold by her abusive father to a brothel. She was at the mercy of the crime lord of the walled city but she dreams of the outside world and of the sister she was forced to leave behind. Mei Yee was a dreamer. At times I couldn’t believe how trusting of others she was. After being sold and living in a brothel I thought she would have picked up more streets smarts! It wasn’t that I disliked her, I just had a hard time believing her character. Jin Lee was by far my favorite character. She was fighting to find her sister Mei Yee. Jin left home after Mei Yee was sold and had been searching the walled city for her ever since. I loved Jin’s steadfast devotion to her sister and how much she cared about those around her. Even after surviving in the walled city she didn’t let that make her hard, or take away her hope. Also, she had a cat. I loved Chma. My problem with this novel wasn’t with the characters but with the plot. I thought it was kind of slow and when the culmination of events happened I found myself not really caring. Not to mention everything ended too perfectly. The ending was wrapped up in a pretty bow but that wasn’t how the city was. It was a gritty, rough, crime ridden city and I wanted the ending to be the same way. Trigger & spoiler warning: I can’t stand books where animals are put in peril. It stresses me out, takes me out of the reading, and is the #1 thing that will force me to DNF a book. To warn everyone this book does have a cat that is hurt but not killed. Chma survives and there is a happy ending! I just thought I should put this warning out there in case this detracts from anyone else’s reading. 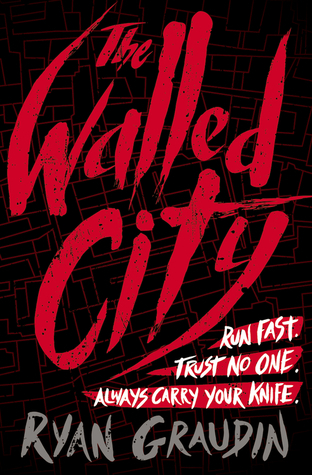 Overall, The Walled City was a gritty, interesting, and well written novel. I enjoyed Wolf by Wolf, Ryan’s second novel, more, but this standalone novel held its own and made me care about the characters.